Sipping a refreshing, cold soup on a hot summer day makes any meal feel decadent and special. 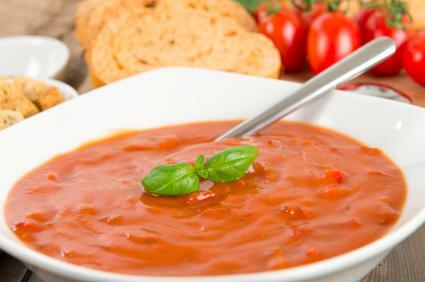 Whether you are looking for a simple dessert-style soup to serve to guests at a backyard party, or something more savory to accompany dinner, cold soups make a wonderful addition to any summer menu. These soups can all be made well ahead of time and chilled in the refrigerator until needed for a quick meal on a day when it's too hot to cook. 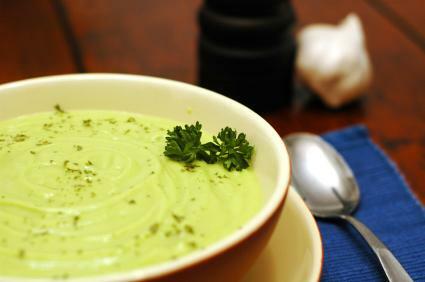 Avocados have a creamy, rich texture that makes a wonderful base to a cold soup. The lime juice and cilantro in this recipe make it the perfect accompaniment to summer salads or as a starter to Mexican meals with marinated meats and tortillas. If you are serving this soup on its own, consider topping it with a mixture of sautéed fresh corn, diced onions, and chopped bacon before serving. Slice the avocados in half and remove the pit. Peel the skin from the avocados and slice them into pieces. Place the avocados, broth, lime juice, crème fraîche, salt, and cilantro in a blender. Pulse the blender a few times to combine the ingredients, then blend on high for two to three minutes. Scrape down the sides of the blender and slowly add the water, stopping to blend every 1/2 cup until the soup reaches the desired consistency. Store covered in the refrigerator up to three days before serving. This bold soup makes an excellent alternative to gazpacho and makes a wonderful addition to many different meals. Serve it alongside plank-grilled salmon and fresh corn for the perfect summer meal. Slice the peppers in half and remove the seeds. Brush the peppers inside and out with olive oil and arrange face down on a baking sheet. Place the peppers in an oven preheated to 450 degrees and roast for 10 minutes, or until cooked through and slightly blackened on the edges. Remove the peppers from the oven and peel off and discard their skins. Chop the onion and potato into small pieces. Heat the remaining olive oil in a large pot and sauté the onion and potato until tender. Add the peppers, cumin, chicken broth, and water and simmer for approximately 20 minutes. Peel and seed the tomato. Purée the soup, along with the tomato, in a blender on high until thoroughly combined. Chill a minimum of four hours and up to two days before serving. This cold dessert-style soup is perfect for any time of day. Serve it at the end of any meal to cool off, or serve on its own with an assortment of cookies for an afternoon summer tea. 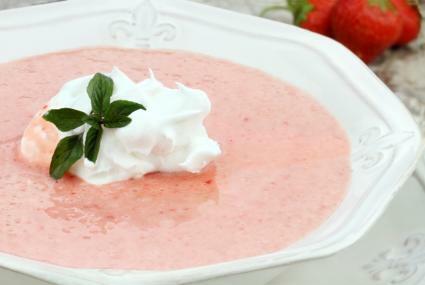 Place the strawberries, milk, cream, and crème fraîche in a blender. Pulse the blender several times to break up the frozen strawberries into smaller pieces. Blend on high until the soup is smooth. Add sugar to taste and blend again. Serve with slices of fresh strawberries and whipped cream on top. Cold soup may sound like an oxymoron, but these refreshing soups are the perfect way to cool off on a hot day. Try them the next time you want a simple, chilled accompaniment to any meal and taste how good cold soup can be any time of day.